Meet Asachill – the Tokyo-based J-pop singer who also works at the famous Kawaii Monster Cafe in Harajuku. Featured often in our street snaps for her eye-catching street styles, the pop and style icon caught our eye today with her mint green hair and colorful outfit. 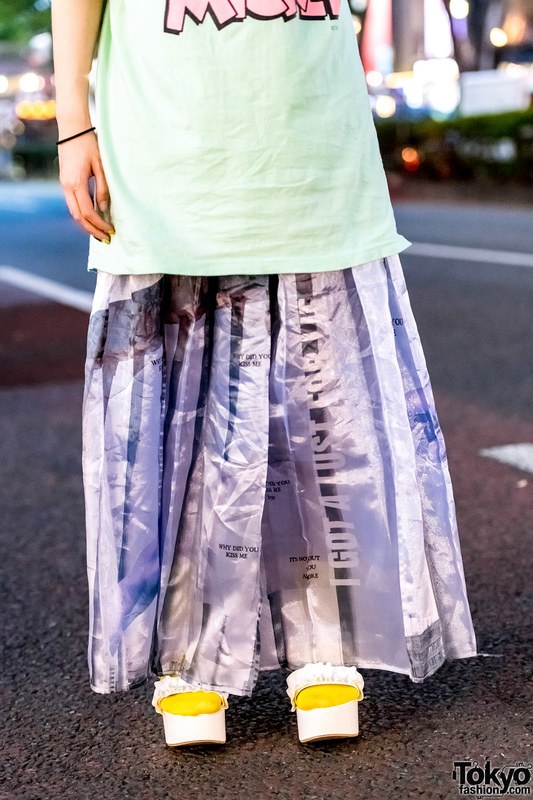 Asachill’s outfit features a mint green oversized Mickey Mouse t-shirt from Poneycomb Tokyo, which she paired with an M.Y.O.B semi-sheer pleated maxi skirt in satin blue, yellow socks, and white platform sandals from WEGO with ruffle straps. Jewels on the bridge of her nose, mismatched statement earrings, and a Vivienne Westwood orb pendant necklace are the finishing touches to her style. In addition, she is toting a yellow smiley face backpack – sourced from UNIF. M.Y.O.B. NYC and Listen Flavor are two of Asachill’s favorite Japanese fashion brands. She likes the music of Chara and Yuki. Follow Asachill on Twitter, Instagram, and her official website.